...is Carl Pavano? Perhaps. Because of the way the Yankee pitching rotation has been aligned, Pavano might end up being the starter on Opening Day. In an article posted by Bryan Hoch on the Yankee site at MLB.com, Joe Torre said, "It's Opening Day, but there are 161 other games. It certainly is an important game, but so are the other ones." Yes, that's true, Joe, but will Pavano be around for all those other ones? 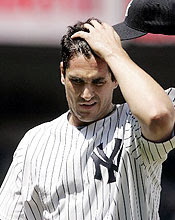 Pavano hasn't pitched in a Major League game since June 27, 2005. He's been rehabbing from various injuries, real or imagined, since that time. So far this Spring he's been injury-free. This is could be just what Carl Pavano needs. If he pitches well, the media will undoubtedly proclaim Opening Day 2007 as "The Day Carl Pavano Became A Yankee," just as they did for Jason Giambi that rainy night a few years back when Giambi hit his walk-off homer against the Twins, getting the monkey off his back and finally turning Tino Martinez into a nice little memory. But, what if he doesn't pitch well? For his sake, I hope we don't find out the answer to that question.